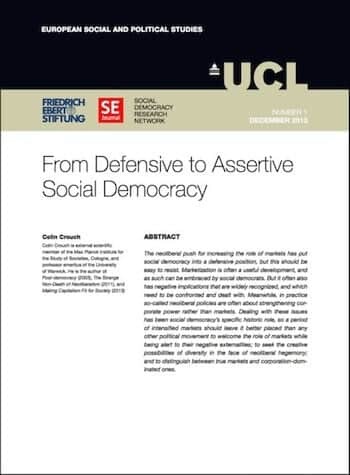 The neoliberal push for increasing the role of markets has put social democracy into a defensive position, but this should be easy to resist. Marketization is often a useful development, and as such can be embraced by social democrats. But it often also has negative implications that are widely recognized, and which need to be confronted and dealt with. Meanwhile, in practice so-called neoliberal policies are often about strengthening corporate power rather than markets. Dealing with these issues has been social democracy’s specific historic role, so a period of intensified markets should leave it better placed than any other political movement to welcome the role of markets while being alert to their negative externalities; to seek the creative possibilities of diversity in the face of neoliberal hegemony; and to distinguish between true markets and corporation-dominated ones.